Io e il mio compagno abbiamo affittato questa proprietà [Casa Limoni] a fine giugno per una settimana per festeggiare il nostro matrimonio con amici (week end) e parenti stretti (resto della settimana). Tutti sono stati entusiasti di Casa Limoni! le case sono bellissime, arredate in stile toscano e molto curate. Le cucine sono super attrezzate! Il giardino e' spettacolare e la piscina fantastica! Ci sono tantissimi giochi per bambini sia da interno che da esterno. Le foto non riescono comunque a rendere la bellezza e l'atmosfera che si vive nella proprietà. Le grigliate in giardino, i pranzi sotto il portico sono ricordi meravigliosi! Il taglio della torta il giorno del nostro matrimonio indimenticabile! Peraltro la posizione è ottima: si trova a dieci minuti di macchina da Lucca, immersa nel verde e con a 5 minuti un supermercato esselunga! James e' stato veramente molto gentile e disponibile con noi! La consiglio vivamente per una vacanza da sogno! - Silvia S and family/friends, from Milan, guests June 2013, the week of her wedding in Lucca. Congratulations Silvia! The villa was amazing. The views and the architectural detail was nothing short of breathtaking! James took care of everything,and after a magical day of exploring the hill towns, we arrived home to the villa just in time for a glass of wine under the stars, and a heart warming, home-cooked meal right at our very own villa table. Italy shouldn’t be traveled any other way! The villa was amazing. We loved everything. The best vacation we've ever had. We will be back! After a hard years working in Australia we were lucky to include a weeks stay at Villa Aquilea in our European trip. My wife, son and myself joined some other friends at the Villa for the week. The Villa itself,and the surrounding rural setting of Aquilea perched on the mountain side, are superb. The hospitality and friendliness of the owner James ensured our stay ran smoothly and exceeded our highest expectations. This is an experience you wont get staying in any hotels. The Villa is beautifully appointed and decorated with lots of room for our group of ten. Whether lazing in the pool with its infinity edge and breathtaking, floating, views across the valley around Lucca, or sharing a pizza prepared on the ancient woodfired oven or a glass of wine (sourced from the barrels in the local hardware store, bring your own containers! )while sitting on the outdoor terrace overlooking the valley, this is one relaxing destination. The surrounding hills and charming country roads with their small villages, villas and churches provide an unforgettable opportunity to explore. If you would prefere to walk, the trek through the olive groves and ancient chestnut trees to the top of the hill and the old church ruins teetering on the cliff face high above the villa are an experience you will always remember. 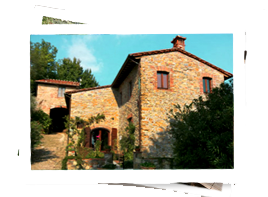 The Villa is central to all that Tuscany has to offer (the old walled town of Lucca, Pisa, Florence, The Cinque Terra etc.). The only worry is making the time to see it all. But dont forget to relax....it is soooo easy. While our week at Villa Aquilea seemed like a month, it still wasn't long enough. Back to work with the batteries recharged and to dream of the next opportunity to visit. Soon....! I must begin by saying that this say was our third year in a row at the Villa, and we are preparing to visit again this July and August. The service and attention to our needs was above and beyond that of the norm. The Villa is fantastic, and we really feel like it's our home, it has all the aminities you would want or need. The location is perfect the view is out of this world, so nice and quiet. The locals welcome you with a smile and a wave. There is nothing we disliked about our visits to the Villa, we would not have returned if it wasn't great. Ciao - Jim & Pat A, Milton Georgia, guests 2007, 2008, 2009, 2010. 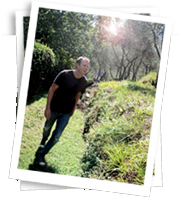 Our 2009 Thanksgiving visit to Villa Aquilea was truly an authentic experience. We joined eight friends, two of whom had visited the Villa twice before. Not only were the accommodations lovely, but we felt as though we were an integral part of the Tuscan experience. The view of the valley from Villa Aquilea was awesome. Everyday there was something new to discover. Our only regret was that we did not stay longer.- Abbi C, Lafayette Louisiana, guest 2009. The [enclosed] DVD [about our vacation] was a 3-week project of love that kept me looping back to the vacation, not wanting to let it go. I guess I got carried away… Please feel free to use any part of it you want. I would like everyone to know what a wonderful experience can be enjoyed at the Villa…. The B. family is definitely coming in May. That is OUR week, so don't get any funny ideas about renting it out to anyone else! - Clyde B., Raleigh Durham North Carolina, guest 2006, 2007 and 2008. "Words can not describe my vacation of a life time. After my first trip to Italy I knew I wanted to go back to the Tuscany area and rent a villa on the top of the mountain. When I did this I had no idea what a spectacular place I have picked. Of course I had some help from my daughter from NY who knew someone that said there is no other place to go. How true those words were. I am 69 years old and I have no desire to go anywhere else in the world after taking this trip. I truly thought I had died and gone to heaven. Oh, I would go back in a skinny minute... There were 12 of us from ages 5 to 69 (family, family friends and friends)and what a wonderful time we all had. James, the owner, was a delightful young man that saw after all our needs and helped us with everything. We had massages, Italian dinners cooked in the home, (one meal was French as we had a family that came from France to be with us) directions to wherever we wanted to go and nights on the town with music in the streets. There was not one minute of our vacation that I did not enjoy. I know I have rambled, but like I said in the beginning there are no words to describe this place. You must go there and see for yourself." "The best vacation we have ever had. Our family consisted of my wife and me, three of our adult children and 4 grandchildren. We were there for 2 weeks. Villa was terrific, furnished with everything you needed, great location for daily trips to other great cities. Swimming pool was super for the grandkids. James was very easy to work with and had all the answers to our questions. A once in a lifetime experience." "I can actually say to friends that I cooked an Italian meal in Tuscany. We visited Florence and Pisa during the day and then came back to this beautiful place in the evening. We watched the movie Under the Tuscan Sun while visiting and then looked around and it was not a movie it was real. We would recommend the experience to anyone." "Our week in aquilea was magical in many respects. The most magical was the view we enjoyed along with the wonderful friends we went with. Our cooking class was definitely a highlight. The guys in our group will talk about the trip to the blacksmith forever!!"